The Close runs south to north off St John’s Wood Road, to the east of Hamilton Terrace. It was part of an old track dating from Elizabethan times which had run from Lisson Grove along Hamilton Close and northwards to Kilburn Priory. 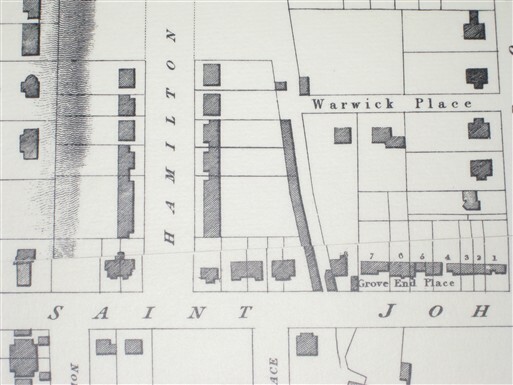 At the beginning of the nineteenth century it formed the boundary between the Eyre Estate to the east and the Lyon or Harrow School Estate to the west. Parts of this boundary wall still exist. 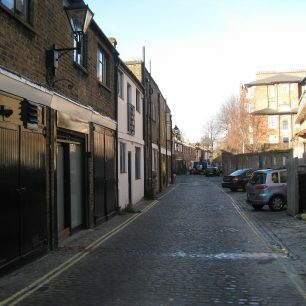 The mews appears on the earliest maps, around 1827, and was possibly built before the building began of the Terrace itself. Some of the coach houses would have been linked to the houses in the Terrace, others were not. There are 26 in all. Until the end of the 20C there was a shop on the west side occupied by Martins which provided all services such as handyman, carpenter, plumber. Derek Raggett who still does any plumbing jobs, used to work for them. the home of Lord Mervyn Horder (1910-1997) who was an English composer. He composed numerous songs to words by Shakespeare, Herrick, Betjeman and Auden. garage for Sir Charles Mackerras the orchestral conductor when he lived at 10 Hamilton Terrace. garage for Philip Jones the trumpeter when he lived at 14 Hamilton Terrace. garage for Michael Pennington the actor when he lived at 11 Hamilton Terrace. garage for Sir David West-Russell (1922-2004) the judge and president of industrial tribunals for England and Wales (1984-91) who lived at 24 Hamilton Terrace. 1985 – home for Sir Hugh and Lady Cortazzi. Sir Arthur Henry Hugh Cortazzi, GCMG (born 1924) is a British diplomat. also a distinguished international businessman, academic, author and prominent Japanologist. home for Catherine Yarrow, painter, printer and potter (1904-1990) Catherine originally lived in 28 Hamilton Terrace but during the sixties, money ran out. 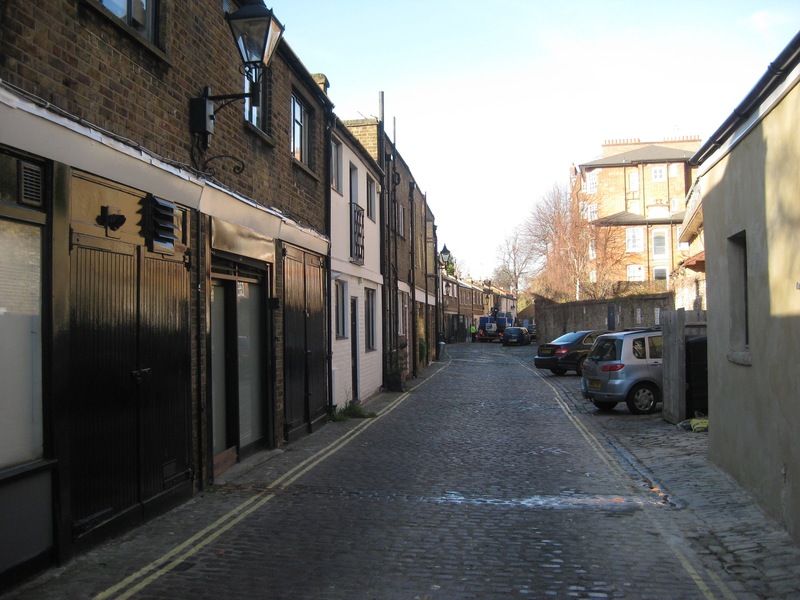 She sold the big house, converted the mews garages belonging to the house into studios, created a kitchen, bedroom and bathroom upstairs, cut the garden in half and moved to the Close where she lived until her death. She built her last oil-fired kiln in the garden, (planning permission was not needed at this time) and regular firings continued up to a few months before her death. 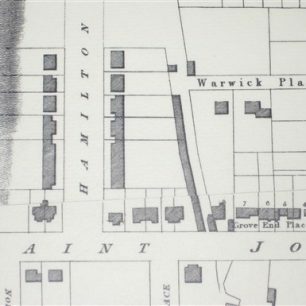 is at the bottom of the garden of 36 Hamilton Terrace and was probably the pavilion/studio of Henry Stacy Marks in the 1870s. It has a north-facing window. According to Lian Lion who was brought up at 36 HT, the “cottage” had formerly been a coal merchants, housing a cart and horse. It was also used at one time as storage for theatre flats. At some date the bottom third of the garden of 36 HT was walled off, creating a separate dwelling with garden where Lian and Phoebe May moved to when her parents’ house was sold. This page was added on 06/01/2017.